SNES Super Metroid (JPN/USA) in 48:09.9 by Terimakasih. 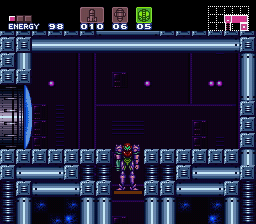 This is like a SNES version of the NES metroid, with the consequently better (and bigger) graphics and music. Due to how the game tracks time, the in-game completion time is 28 minutes (2 minutes better than the previous version). Items collected: 25% (2% less than the previous version). This movie's existence, thanks to many Kindly&Technical people. The movie file (SMV and AVI) is longer than the previous one because the previous one didn't include the intro.